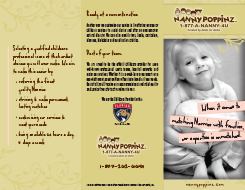 I loved everything about nannypoppinz.com! It is an excellent website with wonderful helpful people who came through for me at a moments notice! We were definitely highly satisfied with the quality babysitting care and love the entire experience! And to top it off our sitter was wonderful...very professional, caring and perfect for our kids! Will definitely use this service again!! Amazing overall experience! Thank you! I am so amazed that you found a Nanny for me, within an hour, at 3:30 in morning, on a holiday week! And the Nanny who came to my house was absolutely lovely. Nanny Poppinz is my new hero! This is our first time using your service. Our Nanny for the day was Naomi. We were very pleased with her care. She was prompt, kind, knowledgeable, very comfortable and warm with our daughter from moment one. She did an excellent job. I could not be more pleased - I called at midnight for someone to come the next morning and Carroll was at my door by 8am. It was amazing and she was fabulous! We used you to find a temporary Nanny and the booking service was professional & very efficient. We were provided with a great Nanny at fairly short notice who looked after our daughter really well. This made for an impeccably convenient method. I don't have a back up sitter to my 4 sitters, and when all failed, I get completely helpless. This site took that feeling away entirely. I'm very grateful for it!